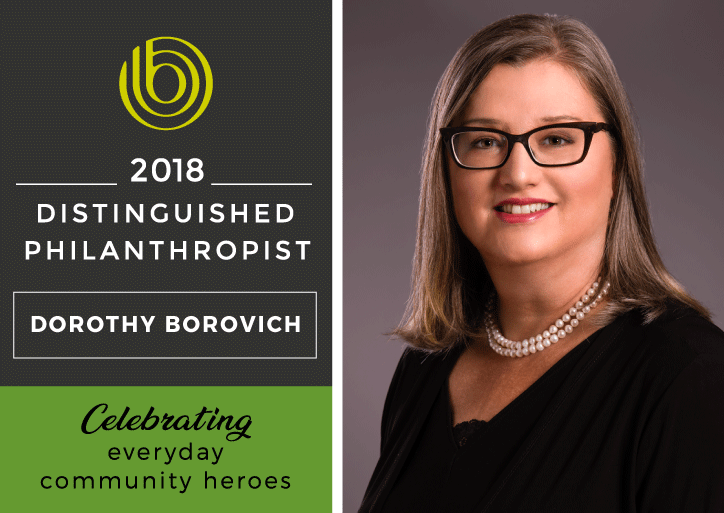 Burlington, ON – October, 2018 – Burlington Foundation was delighted to recently honour one of Burlington’s finest Everyday Community Heroes, Dorothy Borovich, with the 2018 Distinguished Philanthropist of the Year Award. Honoured October 18th at People Power 2018, over 200 community members came together for the evening celebrating Dorothy and community giving. The Distinguished Philanthropist of the Year award presented by Great-West Life, London Life and Canada Life offers the chance to publicly honour and thank a noted philanthropist for their positive impact on Burlington and surrounding communities. This year’s award recognizes and celebrates an Everyday Community Hero and Dorothy is the first female in Burlington to receive the stand-alone award since it was established in 2009. Dorothy has been actively involved as a volunteer in Burlington for more than 20 years and was a member of the Burlington Foundation Board of Directors from 2002-2005. Her extraordinary work has been instrumental in establishing a variety of endowment funds with the Burlington Foundation to support youth, police services, and health and wellness. Dorothy is co-founder of Youthfest, a group that established a fund and holds an annual event that connects youth to meaningful volunteer opportunities. As a committee member of Community Cares Halton, she was one of several leaders who created a fund and established the Halton Heroes Gala in support of police officers and their families who have been injured or killed in the line of duty. After being diagnosed with breast cancer, she established Healthy Reflections Canada and a fund that supports treatment for women who have been diagnosed with breast cancer and are financially challenged. Since 2009, Burlington Foundation has celebrated local philanthropists meriting community-wide recognition for their generous contributions to Burlington and beyond. This year, our program recognizes and celebrates an Everyday Community Hero. A community giver who quietly recognizes the power of one person’s influence. An individual who has a history of constantly thinking about how they can take action and help others. We are pleased to have recognized past Distinguished Philanthropists of the Year honoree’s including: Don Smith, Kevin Brady, Doug Leggat, Murray and Diana Hogarth, Ralph and Susan Sgro, Gary DeGroote, Ron Joyce and Wally Pieczonka (scroll down to learn more about our valued past honourees).